We are your nearby galvanizing professionals. Ohio Galvanizing has been providing cost-effective, maintenance-free, environmentally-safe corrosion control solutions for nearly fifteen years. Our shop is dedicated to delivering hot-dip galvanizing to ASTM specifications with industry leading turn around time. We are centrally located in Marion, Ohio. In fact, approximately two-thirds of the U.S. and Canadian markets are within a day's truck drive from us. We are an active member of the American Galvanizers Association, a non-profit trade association dedicated to providing technical support on today's innovative applications and state-of-the-art technological developments in hot-dip galvanizing for corrosion control. We are galvanizers, and so much more. 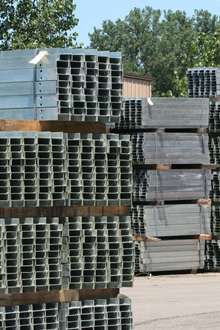 Our kettle size of 30'6" long x 5' wide x 7' 6" deep means we can hot-dip galvanize products up to 46' in length. Ohio Galvanizing specializes in working with companies that have a repetitive need to galvanize the parts, products and fabrications that require special attention to produce a quality finish at a competitive price. We are galvanizers who pay attention to your bottom line in several ways. Many times we've worked with our customers and suggested design changes in their products so they can more efficiently and economically be galvanized. We are flexible enough to package your product to fit your needs. If they need to be specially packaged, arranged in a certain order, numerically or color coded - you name it, we can do it for you. We understand the need for speed, and for today's JIT delivery schedules. So we give our customers realistic delivery times they can count on. Do we meet these 100% of the time? Of course not. But we strive to live by our credo to DWWSWWD - to do what we say we will do. Our team communicates with your team. We don't presume, we ask. We recognize that making things easier for you is the ultimate goal. From product design to delivery, from quotation to invoicing, you need things done your way. And it's our job to make it so. Our goal is not to provide the lowest price. It's to provide the best value in galvanizing, done well and delivered on time. But please don't take our word for it. View our testimonials and see for yourself what our customers have to say about working with Ohio Galvanizing.